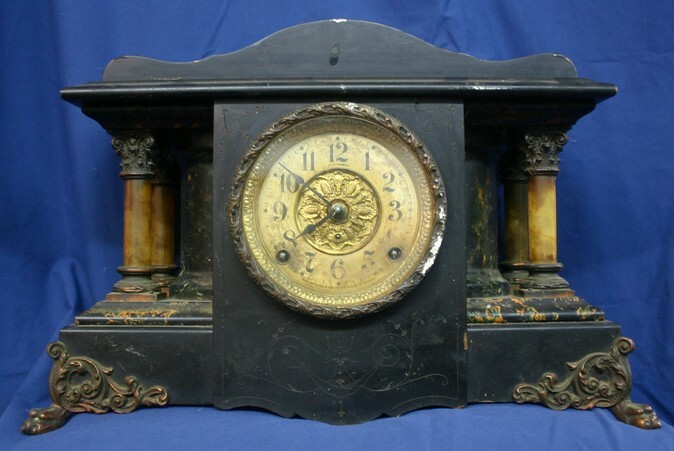 The following pictures show various examples of clock cases both before and after the cases were thoroughly cleaned or completely stripped and refinished. 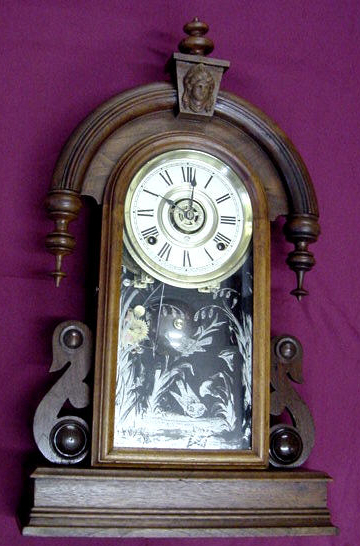 Many clocks can be made to look good again with just a thorough cleaning. Others have a finish that is so badly damaged that stripping and re staining is required. All of these jobs were done in house by Master Clock Repair. 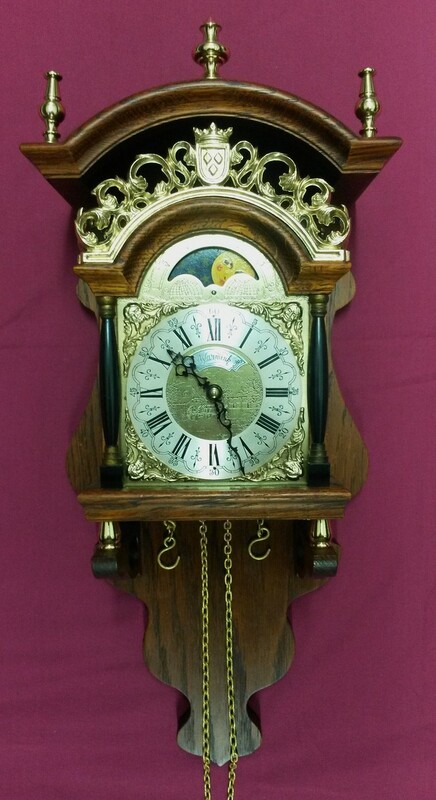 We thought it would be interesting to show two different levels of clock case cleaning and restoration. The first two pictures show an example of cleaning the case and its component parts only. 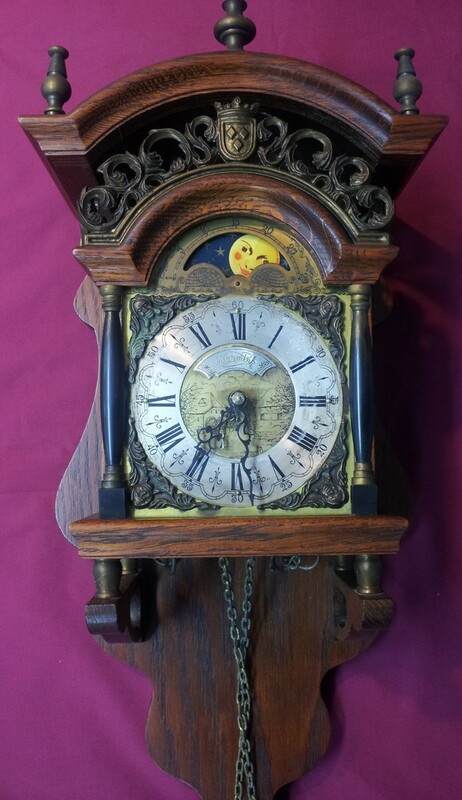 The second two pictures show not only the case and component parts cleaned but the metal ornaments cleaned, primed and repainted and the paper dial replaced. 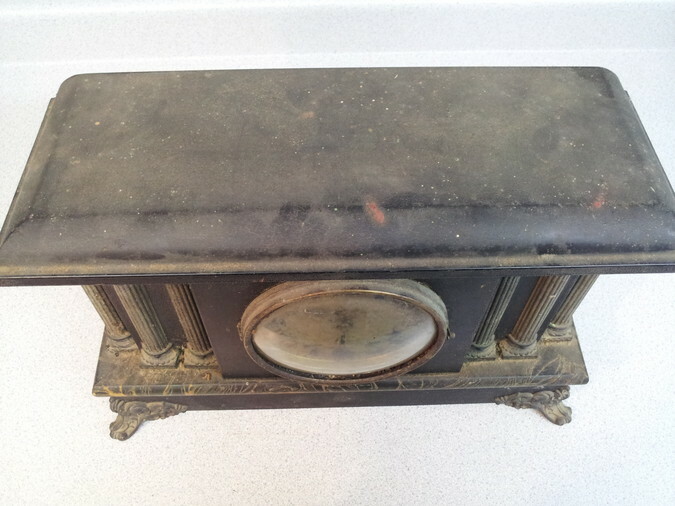 You can see here how dirty the clock case is. It looks dull and lifeless. Now the clock comes alive with a polished surface, clean ornaments and a polished brass bezel. Now that it is clean the cut design surrounding the dial is visible. Here is the case as we received it. Notice the very dirty, stained paper dial and that the cut geometric designs are not very visible. 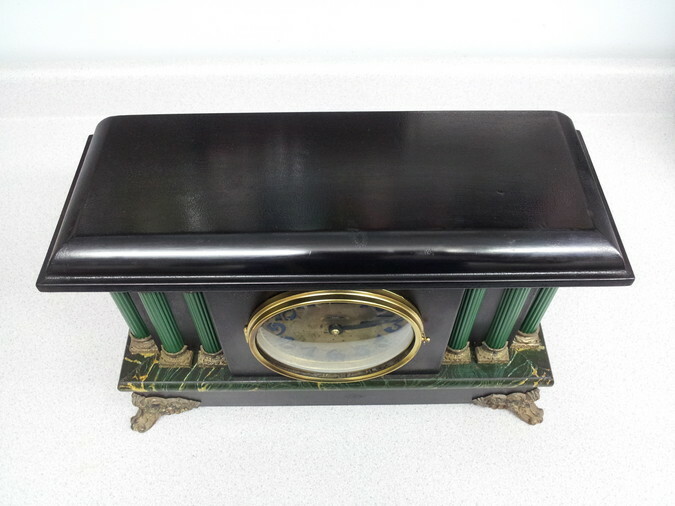 Once again we have cleaned and waxed the Adamantine case as well as polished the brass bezel that holds the glass. Additionally we have cleaned, primed and painted all the metal ornaments as well as replaced the badly worn paper dial. This is another Adamantine style case shown from a different angle. Adamantine is a word that Seth Thomas trademarked in order to describe their process of overlaying a wooden clock case with a very thin veneer of plastic. This was not done because the clocks were cheap. 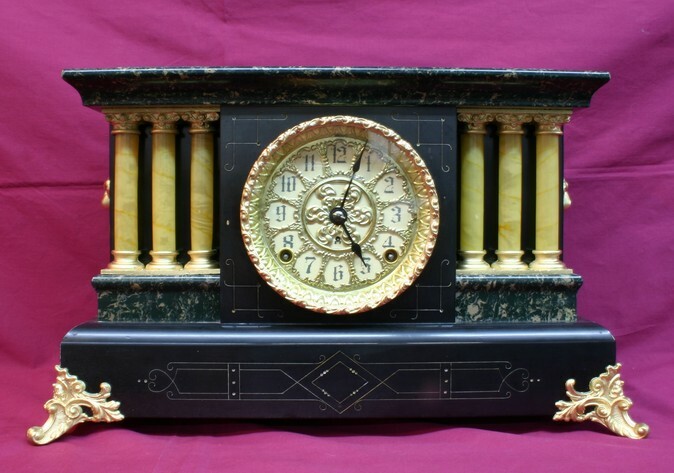 This was done to provide a unique and "durable" finish for clock cases. After the case was cleaned the Adamantine veneer is actually waxed like you would with a car body. You can see how the case shines after waxing. The brass bezel was also polished. The other ornaments are made from cheap metal and most of the original finish was missing. Some people have us paint them to look more like they did when the clock was new. Others, like this customer, just wanted them cleaned and reinstalled. This clock was shipped to me from out of state. 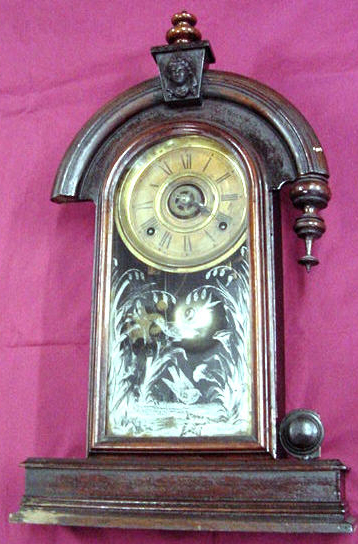 The clock meant a great deal to its owner as it was a family clock. 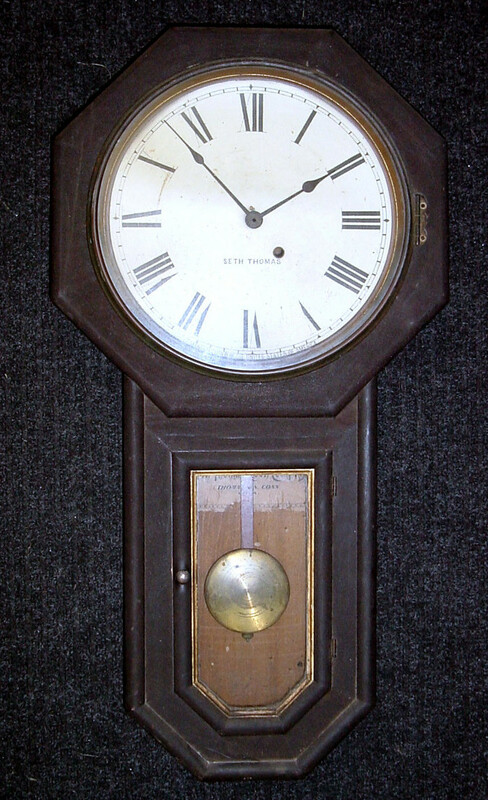 I was authorized to perform a complete restoration of the movement, dial and cabinet. This is how it looked when I received it. Here you see the fully restored clock. It was necessary to disassemble the case almost completely in order to clean all the nooks and crannys. All the brass components were removed, stripped, hand polished and re-lacquered. Even the dial had to be disassembled in order to be restored properly. Someone had already began the stripping process when it was brought to me. Looks great now! We finished the stripping, lightly sanded the case and re stained. We also polished the bezel and dial pan. 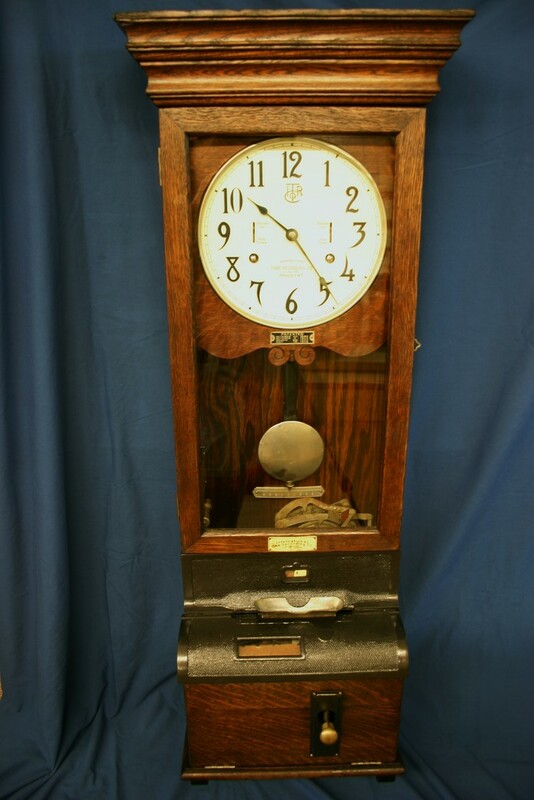 This is the case of a brass carriage clock. To clean and polish the case properly it must be completely disassembled. Here it is taken off the base but still intact. Not counting the screws a case like this would typically have 15-20 parts. Same case completely polished and reassembled with the movement installed. After disassembly the parts are stripped of their original clear finish, polished using three different grits, recleaned and then lacquered. 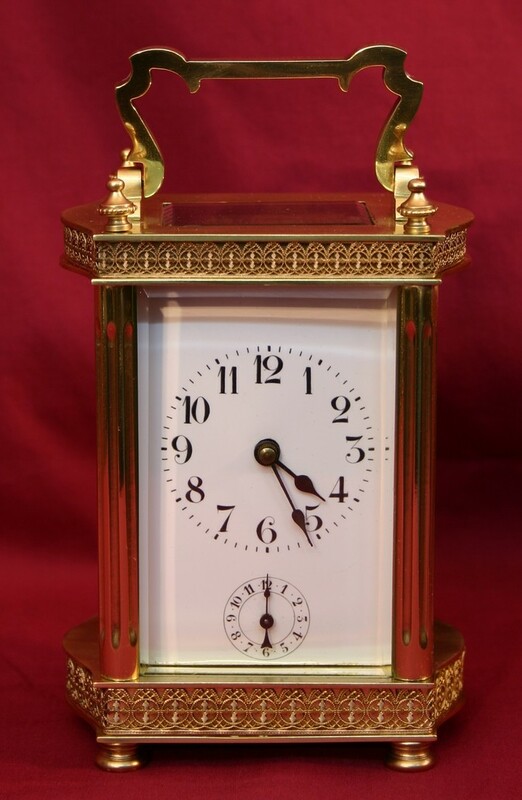 These are truly beautiful clocks when they are polished correctly. 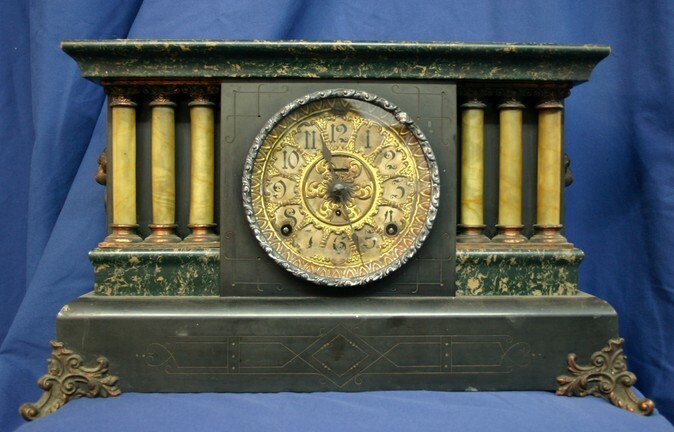 Another brass carriage clock but more ornamental than the previous example. Completely assembled and beautiful! Once this work is done it is very important not to handle these clocks with your bare hands as continued contact with the oils and sweat of our hands will cause them to quickly tarnish again. Mondays, Tuesdays, Thursdays and Fridays we are usually open from 10 am to 6 pm and Saturdays by appointment only.